I'm ashamed to say I waited to see this film until now. 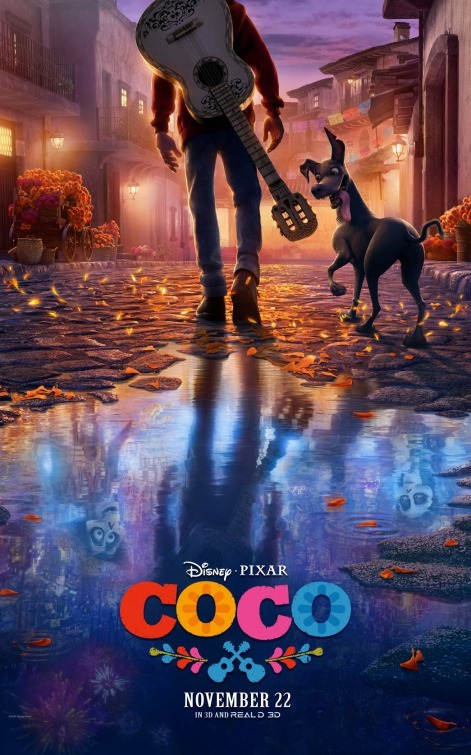 "Coco" opened a month ago and I wanted to see it but I was not in a rush. Usually a Pixar film would be a top priority, an opening weekend must. Something about the film put me off. I just didn't feel the same urgency I usually feel about these movies. I ultimately skipped "The Good Dinosaur" a couple of years ago for the same reason. Boy am I glad I didn't repeat that decision this time. 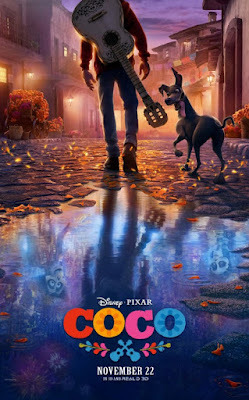 "Coco" is a spectacular film and will certainly be among my favorites of the year. It might have been the Dia de Muertos subject matter. Although the animation looked spectacular for The Book of Life" a couple of years ago, I have still never seen it. The controversy over the inclusion of the "Frozen" short may also have played a part in keeping me away. Well, there was no 25 minute Olaf short in front of the show we went to, and that is good because it keeps all the focus on this really terrific film. The idea of the Land of the Dead being a place that could be visited by a living person is a little disturbing. And as Miguel, our hero stays longer, he begins to resemble "Jack" from "An American Werewolf in London", Maybe not that gruesome but in spirit at least. Creepy stuff for a kids film but the cultural roots of the story rescue it from being morbid and actually turn the setting and theme into a sentimental piece that people of a variety of cultures can appreciate. The skeleton images that are associated with Dia de Muertos, are not really designed to be frightening but rather a depiction of what an afterlife might resemble. The main characters in the story turn out to be relatives of Miguel who now reside in the land of the dead and are key to his accomplishing his goal of playing music. There is a lot of humor in the film, much of it based on the displacement of skulls, bones and assorted body parts. There is also some appropriately themed Mexican style music composed by Michael Giacchino (who is not a Mexican but was assisted by musicians who do know the music) that sets a tone that is mysterious but also culturally familiar. People seeing this movie will have a much greater understanding of some of the Mexican traditions that they may only have a passing knowledge of to begin with. Although there are twists in the story that you can see coming, and the structure is familiar to anyone who has seen a Pixar movie in the last twenty years, the film still manages to be surprising. It is also sentimental and very moving. Parents might want to be warned that there is a subplot that deals with murder, and that may be hard for the young ones to work around. The vividy realized world and the rules under which it operates however are creative as heck and you may be stunned by how beautiful the film can be at times. Especially memorable is the role that an elderly woman plays in the story. While this might be reminiscent of last year's "Moana", the way it plays out is very different and it does offer children something to value. All of us live on because we are remembered. Heck, that's one of the reasons I started writing this blog, so my kids and grand-kids (if I ever have any) will be able to know me better. This movie is hanging around the box office long enough for all of us to be able to remember it. The theme song is special and ties into the principle behind the movie especially well. I suspect that the tune written by Robert Lopez and Kristen Anderson-Lopez, will be recalled by the Academy Members as well. I really loved this movie and I hope to see it again and maybe write some more about it's ideas, but for now I just want people to know how I feel.